The headband of the headband is made of stainless steel. Adjustable length And stretching with the ears Helps spread the pressure of the head Increase comfort while wearing And strong Ear pads designed to be exceptionally soft Is copyright only To help increase firmness And reduce pressure around the ear The side of the ear cover with 105 numbers indicates the ability of the ear muffs to reduce noise levels up to 105 decibels, receiving ANSI S3.19-1974 standard. Green noise reduction ear plugs Made from soft synthetic rubber With slender, smooth surface, consisting of 3 layers of wings arranged together throughout the plug The rod tip is convenient to handle and remove. There is a box made of strong plastic. 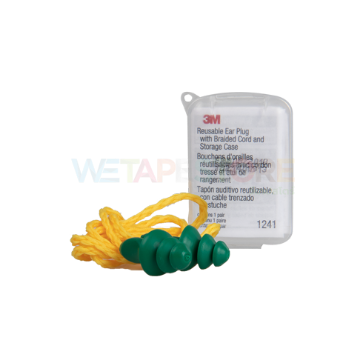 Easy to carry Prevent loss, noise reduction value of 25 decibels, easy to clean.